How many of you noticed that the Boots Christmas Gift Guide contains the same products every year. The majority of gifts sets are identical they simply redesign the packaging. This repetition means I do more shopping online with independent retailers. With that in mind here are some gifts that have caught my attention. Of course any beauty product featured here will be free from synthetic ingredients. Cowshed has a nice collection of beauty gift boxes for men and women. Prices range from £10 to £40. No gift collection would be complete without mentioning Bodhi’s Little Treats. At £12 these are an affordable gift and larger gift boxes are also available. You can buy direct from Bodhi's website or via Cutecosmetics. For the girls that love make up bareMinerals have a great gift collection. I particularly like the Tutorial boxes. Staying with the theme of mineral makeup I love Lily Lolo Glossary 3 piece lip gloss sets and Ready Set Go collections (if you are Vegan please note that some of their lip glosses contain Carmine). Pure Thoughts gift boxes and Dilly Day Dream shower caps are a firm favourite and you will have seen me mention them before. Alongside their regular gift boxes Pure Thoughts have a selection of Christmas themed gifts. 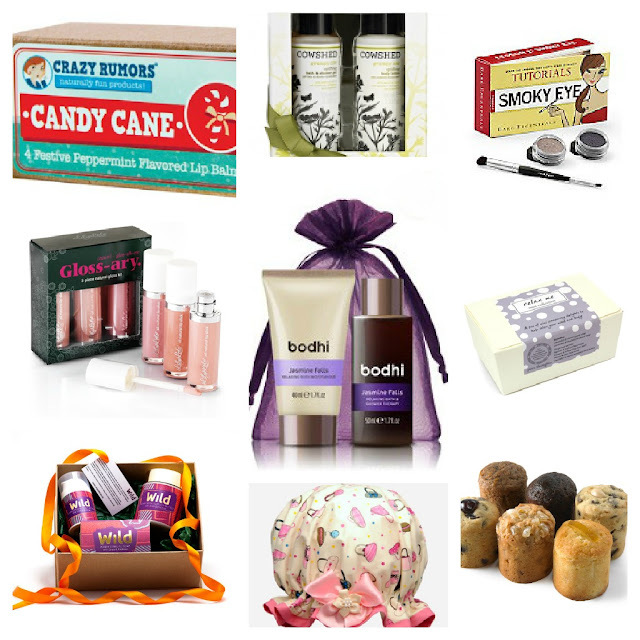 If you need a gift for a body butter addict then take a look at Wild's Christmas gift box. It’s available in a variety of fragrances and includes body butter in two sizes (170ml tub & 50ml dispenser) & a soap for £28.25. If you know someone with a sweet tooth I can recommend Meg Rivers. Mini Megs have always been a hit when I have sent them to friends. Alternatively you could buy a Cake Club subscription. For those with allergies I recommend Rebecca's Cakes. Green People have a lovely selection of gift boxes for men, women and babies. You can buy direct from their website or I've seen them on Feelunique. Essential Care also have a range of gift boxes starting from £11.50. The Ultra Sensitive Organic gift set which contains shampoo, body wash and balm (£15) would be prefect for people with sensitive skins. Us girls usually like cute gifts so check out Juicy Lucy for fairy themed stationery and trinkets. Tofu Cute is a site stocking Japanese cuteness. They have stationery, treats, purses, keyrings and other charms. If you are looking for stocking fillers then take a look at friendship bracelets from Lily Loves Lola. Finally Not On The High Street is a fantastic gift website that everyone should have bookmarked. You are right, Boots always seem to have the same old stuff so this is a lovely selection of gift ideas! I think so many pre packaged gifts are just too generic and come across as thoughtless. I would love to receive any of the gifts on your list, and I am going to buy the balm now as it looks so good! I love those balms it's the variety of flavours that I find exciting as well as the quality of product. Thanks Sarah. Just working on a similar post for SkinsMatter, and also a piece on fragrance allergens, and didn't know about the Essential Care ultra sensitive range. Thanks for the tip!